The Mormon church traditionally announces a statistical update during its April General Conference. For many years now, these numbers seem to show consistent, even exponential growth, making church leader Quentin Cook recently proclaim that “The Church of Jesus Christ of Latter-day Saints has never been stronger. The increase in demonstrably measurable areas, such as endowed members with a current temple recommend, adult full-tithe payers, and those serving missions, has been dramatic. 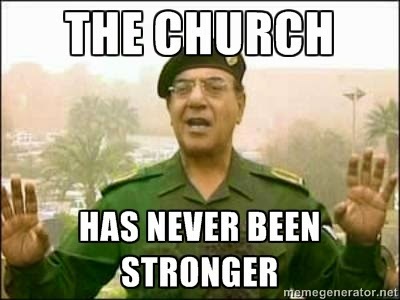 Let me say again, the Church has never been stronger”. Unfortunately, Cook's confidence is misguided. To see this, we first need to understand the difference between exponential and logistic growth. Exponential growth occurs when there are no growth constraints but this basically never happens. There will always be constraints - external, such as the religiosity of the general population, or internal, such as fertility. Barring unusual, disruptive events, all populations develop along an S-curve like the one on the right-hand side of Figure 2 and this is the case for the Mormon church as well. To demonstrate this pattern, however, we need to look beyond the surface of the numbers as presented at General Conference. The first issue to tackle is that of scale. As you can see in Figure 1, it’s very difficult to see what’s going on between 1830 and 1930. That’s not because growth was slow during that first century. On the contrary, during this time the church grew from 280 to 670,000 members – that’s like getting an interest rate of 8.1% every year for 100 years (some of the older readers may remember what that was like). Still, on a chart, 670,000 is only a blimp compared to today’s 15 million members. To even things out, we can use a logarithmic scale. That means that as you move up the vertical axis, you do it like 10 steps at a time, from 200 thousand to 2 million to 20 million. The second issue, as you can see on the logistic growth chart in Figure 2, is that we’re not only interested in the membership numbers but in the growth rate as well. In the beginning, most populations grow at an increasing rate but that doesn't last. At a certain point, growth will slow down and population size will start to level off. Using Figure 3, we can find the point of maximum growth of the Mormon church. The chart only covers the last 100 years because, as you can tell from Figure 2, the point of maximum growth is going to be somewhere on the steep upward slope and, as becomes clear from Figure 1, that’s not happening anytime before 1955. Also, as the horizontal axis is divided in 10-year periods, the growth rate is likewise smoothened using a 10-year moving average rather than the real, erratic annual growth rates. This doesn’t change the data, it just makes for a prettier picture. And it makes clear that for the Mormon church, things went south right around the time Chubby Checker was doin’ the Twist. Turns out church leaders were actually right when they said rock ‘n’ roll was a bad influence. More likely, though, societal trends such as increasing secularisation, declining fertility and, since the mid-1990s, clearly visible on the chart, the information revolution are imposing an upper limit to growth. Apparently, there’s only so much Mormonism the world can stand, no matter how many missionaries and social media campaigns the church churns out. In fact, in 2014, the number of converts per missionary had dropped by 24% since the minimum age for missionaries was lowered in 2012, even 31% compared to the year before. If we take the projected membership numbers and add them to the chart in Figure 1, we get the logistic growth curve of Figure 5. This fits what we know about the behaviour of human populations but it may shatter the dreams of some Mormons who had their hopes pegged onto Rodney Stark’s prediction of 265 million Mormons by the year 2080 (Stark 1984). To be fair, Stark's prediction was mainly intended to focus the attention of social scientists on the actual data regarding the growth of Mormonism rather than the prevailing opinions and prejudices of the time, and today, he considers his prediction "a bit of a lark" (pers. comm. d.d. April 7, 2015). Moreover, in the early 1980s it may have been difficult to see the reversal of the Mormon growth trend, although it might have been more apparent when Stark revisited his prediction in 1998. Nevertheless, ignoring the logistic nature of population growth was a fundamental flaw in Stark's model. So that’s it for Mormonism, 20 million? Yes, it is for Mormonism as we know it today and as it has been for the past 185 years: a thoroughly, maybe even quintessentially American religion. It may not be a coincidence that the rise and fall of Mormonism mirror the growth and decline of US global influence. In order to break through the 20 million member ceiling, Mormonism’s biggest challenge in the 21st century will be to reinvent itself as a truly international movement - or be content with remaining a marginal American fringe movement of Christianity. > Some thoughts about the limitations of this model.